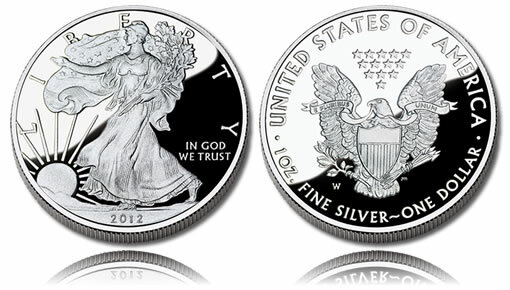 The 2012 American Silver Eagle Proof Coin continues an annual series of proof quality strikes dating back to 1986. American Silver Eagle Proof Coins are a collector version of bullion Silver Eagles also struck by the US Mint. The 2012-dated issue was released on April 12, 2012 for an opening price of $59.95. Each American Silver Eagle is struck from one ounce of .999 fine silver with a diameter of 40.6mm. The proof Silver Eagles have been issued annually from the US Mint, with the exception of 2009 when bullion demand forced a cancellation of the Proof Eagle. Each American Silver Eagle Proof Coin has a legal tender face value of $1. This face value is, for the most part, symbolic, as a Proof Silver Eagle as both a melt and a numismatic value associated with it which are much higher than the $1 face value. The Silver Eagle’s melt value is based on the fact that each is struck from one ounce of .999 fine silver. As such, its melt value is approximately equal to what an ounce of silver is currently trading for on the silver market. For instance, if the precious metal was trading for $32 an ounce, the Proof Silver Eagle would have a melt value of approximately $32 — one ounce times $25 an ounce equals $25. However, the true value of this coin almost always lies in its numismatic value. As these are struck for collectors, they are almost always worth more to collectors than either their face or melt values. Numismatic values also generally increase based on condition and perceived rarity. A strike in near perfect condition from a year with a very low mintage is typically worth much more than a strike in poor condition or one from a year with a high annual mintage. The United States Mint has literally struck millions of American Silver Eagle Proof Coins since their debut in 1986. While that number is high, it really pales in comparison to the associated bullion Silver Eagles of which millions are sold each year. The fact that less Proof Silver Eagles are coined helps to insure their numismatic values remain higher than their melt values. Adolph A. Weinman’s depiction of "Walking Liberty," taken from the 1916-1947 Walking Liberty Half Dollar, is shown on the obverse of all of the Silver American Eagles. It is considered one of the most beautiful designs to ever be struck on a coin of the United States. Surrounding the design are the inscriptions of LIBERTY, IN GOD WE TRUST and the year of minting. The reverse was designed by John Mercanti and shows a heraldic Eagle with shield. Reverse inscriptions include E PLURIBUS UNUM, UNITED STATES OF AMERICA, 1 OZ. FINE SILVER and ONE DOLLAR.